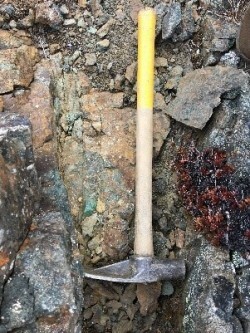 Vancouver, British Columbia, Canada – HAWKEYE Gold & Diamond Inc. (the “Company” or “HAWKEYE”) (TSX.V-HAWK; Frankfurt Ticker: HGT; WKN: A12A61 ISIN: CA42016R3027):is pleased to announce soil and rock geochemical results from its recently completed Phase 2 work program at its 100% owned Boomerang property. The property is located in the Golden Triangle of northwest British Columbia, totals 3,744 hectares (over 37 km2) and is located approximately 25 km northwest of Teck and Copper Fox’s Schaft Creek Cu-Au deposit and 50 km north of Teck and Newmont’s Galore Creek Cu-Au deposit. The 2018 soil sampling program, coupled with historical soil surveys, outlined an approximately 500 metre wide by 1,500 metre long copper-in-soil trend, with the bulk of the values ranging between 100 and 1225 ppm copper (Figure 1). In addition, a total of 26 mineralized rock samples, mainly collected from within the trend, comprise propylitically altered and veined volcanic and volcaniclastic rocks of the Hazelton Group as well as dykes which cut them. Mineralization consists of narrow copper-bearing calcite veinlets and mineralized fractures within volcanic rocks and quartz monzonite dykes. Nine of the rock samples returned copper grades ranging from 0.10% to 1.80%. 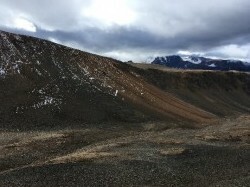 Chip samples included a 0.5 metre sample taken across a fracture zone within mafic volcanic rocks averaging 1.56% copper, and a 0.5 metre sample collected across a potassium feldspar-rich porphyritic dyke averaging 1.71% copper. Chalcopyrite and malachite mineralized basalt, associated with quartz-monzonite dykes (view approximately 1.5 metres x 1 metre). 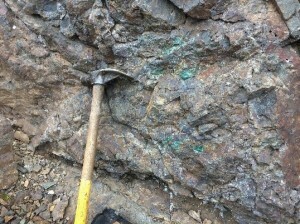 Chalcopyrite and malachite mineralization within fracture zone (25 centimetres across at this locality) hosted by intensely altered volcaniclastic rock; mineralization can be traced for over 20 metres. The copper mineralized trend and associated soil geochemical anomaly appear to follow the southwestern margins of a moderate magnetic high that was identified in a government-run airborne magnetic survey (Figure2). The magnetic high may be interpreted as an intrusion at depth that could be driving the system of alteration and mineralization. Nearby intrusive rocks have yielded latest Triassic to earliest Jurassic age dates, and these are similar to the ages of intrusive rocks that genetically related to mineralization at the nearby Galor Creek and Schaft Creek Cu-Au deposits. Given the encouraging results obtained from the Phase 2 ground exploration program, the Company is soliciting proposals for the recommended high-resolution airborne magnetic survey intended to be completed in early to mid-2019 over the Boomerang property. Subsequent to completion of the airborne magnetic survey, interpretation of the high-resolution magnetic data obtained by the survey will be followed up with additional prospecting, detailed soil geochemical and ground-based Induced Polarization geophysical surveys. Upon positive results, a 2019 drill program will be implemented to test high priority targets. 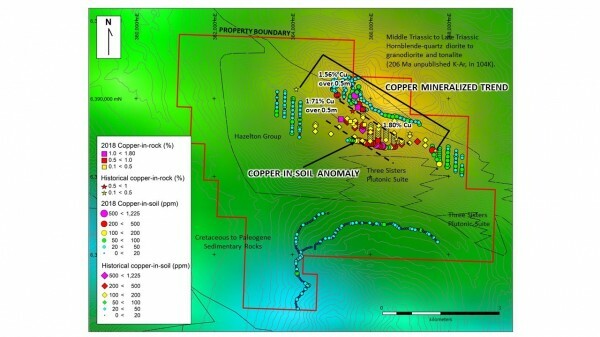 Figure 1: Copper-in-soil trend with significant rock sample locations noted. 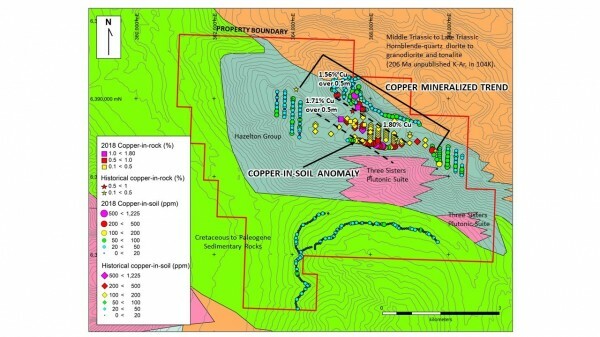 Figure 2: Copper results overlying the Geological Survey of Canada’s Provincial Residual Magnetic Intensity (nT) survey.